Statistics show that a single person is sending and receiving over 200 emails a day on average. This number is expected to grow by 5% each year in the next four years, meaning that by the year 2020 people will be sending/receiving approximately 250 emails per day (Radicati). Getting through the spam filters and reaching the inbox is getting more and more difficult every day. How to make sure that your email is in fact delivered to the recipient? Keep reading! 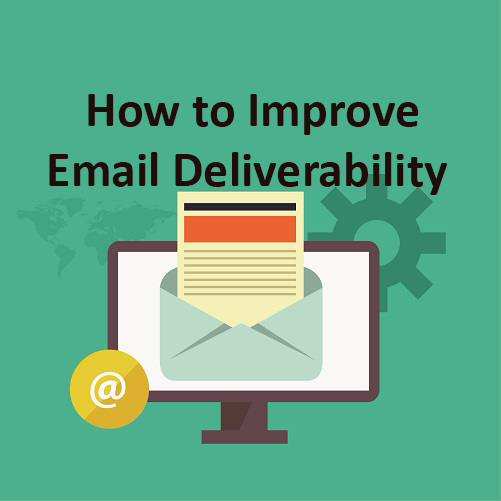 Email deliverability is the ability to deliver emails to subscribers’ inboxes. In terms of marketing, we could define email deliverability as a likelihood of your campaign reaching subscribers or potential customers. Since email marketing has become the most powerful tool for maximizing acquisitions and ROI, it’s a common practice for marketers to reach online users this way. In fact, it’s the most used method, leading far ahead of social media marketing and affiliate marketing. A huge number of emails is sent each day. A certain percent of those is spam. This is why email services now have sophisticated filters to fight spam, and any email looking a bit suspicious will end up in spam/junk folder. While there is a good side to it, as it really saves us a lot of time we’d otherwise have to spend sorting irrelevant emails, a certain amount of emails that aren’t spam ends up in this folder by accident. And if this happens, there actually wasn’t any point for you to send the email in the first place. Occasionally, an email might reach the inbox (kudos for avoiding the spam folder), but the user might never interact with it. Even if someone receives an email, there are no guarantees that they’ll read it. In both of these cases, there are things you can do to stand a better chance of reaching the end users, ultimately improving email deliverability. Here are some of the strategies that should become a part of your email marketing routine, in order to achieve this goal. Your domain name presents your online identity. As people discover your brand, they come to associate your brand name with a certain image, such as being reliable, providing professional service, or having great customer support. When people receive an email, one of the first things they’ll notice is the sender’s email address. If you’re sending emails from the address that doesn’t have your domain name in it, you’re actually increasing the chances of people skipping your email without even reading it. This is why you want to make sure that your sender’s email includes your brand or company name. Not only does this help with increasing email open rate, it also builds your reputation. This is very important for improving email deliverability, because good reputation will help with avoiding spam filters on the long run, while having a negative reputation and being marked as spam over and over again, will automatically destine any future emails to the spam folder. You want your emails delivered and read by recipients. You want to reduce bounce rate and increase open rate. That’s the main goal with any email marketing campaign and it can only be achieved if your email is relevant to the recipient. In order to make sure this happens, you’ll need your own email list. A list of people who are really interested in your company and what you have to offer. Those are people who decide to provide you with their email willingly, through your website or blog. You’re not sure if the people on that list are interested in what you have to offer, so your efforts might be in vain. You end up being marked as spam too many times, as the recipients haven’t given you permission to contact them in the first place. A subject line has a great influence on whether the recipient will open an email. In fact, “35% of email recipients open email based on the subject line alone” (Convince&Convert). Have this in mind next time you start writing an email to your subscribers, regardless if you’re sending out a newsletter with the latest articles from your blog or you’re planning to send a promotional email featuring discounts in your online shop. An effective subject line tells what the email is about. It’s also personal so that the recipient can relate to it. You shouldn’t write too long subject lines either, because “40% of emails are opened on mobile first where the average mobile screen can only show 4-7 words” (ContactMoneky). You should also avoid using all capitals in the title unless there’s an acronym. Keep the subject line short – Short subject lines have proven to work best when it comes to click-through rate. Keep it fresh – Don’t repeat the same subject line just because you’ve noticed it works great. You need to keep the content fresh. Keep it personal – Try to address your readers directly, and be talkative. Use emojis if suitable. Keep it relevant – A good subject line tells what’s inside the email. Think local – Personalize messages using localization, for example including the name of the city. Think time – If your message is time-sensitive, make sure you indicate that in the subject line. Once the recipient sees your email you can consider it a success. You’ve managed to get your email delivered. However, a poor layout design from any past email can affect the open rate in the future. No one will make the same mistake twice. In fact, they might unsubscribe immediately. Therefore, you need to make your emails look neat. Pay attention to the formatting, make sure all the links work, add images, etc. Find an online tool that allows you to use pre-designed layouts or create your own. This kind of email will surely look more professional, which is what you should be aiming for. As a result of sending neat, professional looking emails, you’ll start building the reputation of a trusted sender, which will positively affect the level of deliverability in the future. The mobile market share is around 55% (Litmus, 2016). Additionally, 75% of Gmail users open their emails on mobile devices (Techcrunch, 2015). As much as mobile optimization is important for website design, it’s also important for email marketing. The role of mobile in online marketing has become a central point, meaning that each online marketing action has to consider the mobile aspect as an inseparable part. Therefore, emails need to be optimized to be easily accessible via mobile devices. Otherwise, you’ll be losing a lot of potential readers and visitors. Resizing and optimizing the photos – Photos can cause your email to load slowly. Another scenario is when the device shows only a part of the photo. In both of these cases, the size of the image is the problem. Make sure you reduce the size while keeping the quality in order to make sure the photos can fit the mobile screen and that they look good while being light to download. Increasing CTAs (CTA = Call-To-Action) – Tapping on the CTA is much more difficult with a finger on a small mobile phone screen, in comparison to using a mouse on a computer. Have this in mind when you design CTAs for your next email campaign. Apple recommends 44px squared CTA, while Google recommends CTA, which is 48px squared (MailChimp). Using responsive design – This means that the email width can adapt to any size of the display on which it’s viewed. This process of adapting refers to the entire layout, font size, images, etc. There’s no way to know what works best if you don’t experiment. Even though A/B testing is a well-known method in online marketing, it has a very special place in email marketing. The method basically allows you to compare two versions of the same email to find out which performs better. For example, you’ll send out an email campaign with one email featuring images and the second one with no images to compare open-rate, click-through rate, conversion rate, etc. The same way you could test a subject line, the sender’s name, and any other aspect of the email. Most email marketing tools, such as MailChimp and Campaign Monitor have this feature built-in. This means that you’ll need to select the emails from your mailing list which will be used for testing first. Next, you’ll need to decide what you’re going to test, and customize both email variants so that you can compare the performance of the metrics you want to analyze. For example, use two different subject lines in two email variants. Then the tool will do the rest and you’ll just have to monitor the results. Here’s a very helpful guide on A/B testing with tips on how to get started and what to test: A/B Test Your Email Marketing: How to Get Started, What to Test, and 20+ Apps to Help. Spam filters have a very complex job of sorting the emails based on what is relevant, and what’s going to end up in the spam box. Obviously, this has a major influence of email deliverability. Once sent to spam, your future emails are at risk of ending up there again. Since this has a negative influence on your email campaign, and may cause all your efforts to be in vain, make sure you avoid spam filters in the first place. Words in the subject line – Some words or phrases, such as make money, get paid, free access, etc. may trigger spam filters by default. You can find more about spam filters and best practices here: How to Avoid Spam Filters. The potential that can be gained through email marketing is impressive. We’re witnessing the age where this sort of communication has thrived and managed to keep up with the pace of fast-changing technology. Although thinking about mobile optimization and using advanced tools to customize the layout is necessary, the basic form of communication is still the central point of this kind of marketing. The way you communicate with your readers has the most profound impact on the relationship you create with them. Due to a huge number of email messages sent each day, the way you communicate has to be more sophisticated, more sincere, more professional, and more trustworthy. Combining all of these strategies is what helps you get your email delivered.